Farm Sanctuary's mission is to protect farm animals from cruelty, to inspire change in the way society views and treats farm animals, and to promote compassionate vegan living. Farm Sanctuary was founded in 1986 to combat the abuses of factory farming and encourage a new awareness and understanding about farm animals. 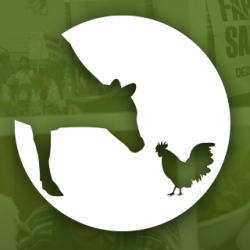 Today, Farm Sanctuary is the nation’s largest and most effective farm animal rescue and protection organization. We have rescued thousands of animals and cared for them at our sanctuaries in New York and California. At Farm Sanctuary, these animals are our friends, not our food. We educate millions of people about their plight and the effects of factory farming on our health and environment. We advocate for laws and policies to prevent suffering and promote compassion, and we reach out to legislators and businesses to bring about institutional reforms. Farm Sanctuary remains committed to ending cruelty to farm animals and promoting compassionate vegan living through rescue, education, and advocacy efforts.